Nothing like waking up to a new article purporting to show vulnerability statistics and having someone ask us for comment. But hey, we love giving additional perspective on such statistics since they are often without proper context and disclaimers. This morning, the new article comes from Help Net Security and is titled “SQL injection vulnerabilities surge to highest levels in three years“. It cites “DB Networks’ research” who did the usual, parsed NVD data. As we all know, that data comes from CVE who is a frequent topic of rant on Twitter and occasional blogs. Cliff notes: CVE does not promise comprehensive coverage of public disclosures. They openly admit this and Steve Christey has repeatedly said that CVE may not be the best for statistics, even as far back as 2006. Early in 2013, Christey again publicly stated that CVE “can no longer guarantee full coverage of all public vulnerabilities.” I bring this up to remind everyone, again, that it is important to add such disclaimers about your data set, and ultimately your published research. Getting back to the statistics and DB Research, the second thing I wondered after their data source, was who they were and why they were doing this analysis (SQLi specifically). I probably shouldn’t be surprised to learn this comes over a year after they announced they have an appliance that blocks SQL injection attacks. This too should be disclaimed in any article covering their analysis, as it adds perspective why they are choosing a single vulnerability type, and may also explain why they chose NVD over another data sources (since it fits more neatly into their narrative). Following that, they paid Ponemon to help them conduct a study on the threat of SQL injection. Or wait, was it two of them, the second with a bent towards retail breaches? Here are the results of the first one it seems, which again shows that they have a pretty specific bias toward SQL injection. Now that we know they have a vested interest in the results of their analysis coming out a specific way, let’s look at the results. First, the Help Net Security article does not describe their methodology, at all. Reading their self-written, paid-for news announcement (PR Newswire) about the analysis, it becomes very clear this is a gimmick for advertising, not actual vulnerability statistics research. It’s 2015, years after Steve Christey and I have both ranted about such statistics, and they don’t explain their methodology. This makes it apparent that “CVE abstraction bias” is possibly the biggest factor here. I have blogged about using CVE/NVD as a dataset before, because it contains one of the biggest pitfalls in such statistic generation. Rather than debunk these stats directly, since it has been done many times in the past, I can say that they are basically meaningless at this point. Even without their methodology, I am sure someone can trivially reproduce their results and figure out if they abstracted per CVE, or per actual SQLi mentioned. 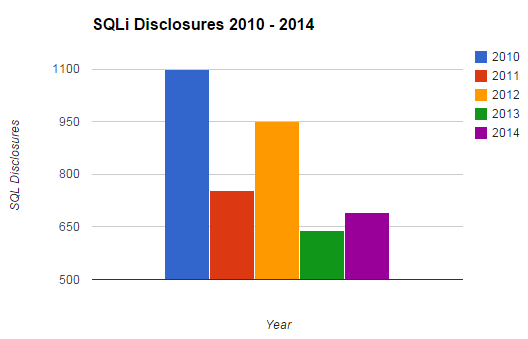 As a recent example, CVE-2014-7137 is a single entry that actually covers 54 distinct SQL injection vulnerabilities. If you count just the CVE candidate versus the vulnerabilities that may be listed within them, your numbers will vary greatly. That said, I will assume that their results can be reproduced since we know their data source and their bias in desired results. Yep, these statistics are very transparent. They are based on a convenient data source, maintained by an agency that doesn’t actually aggregate the information, that doesn’t have the experience their data-benefactors have (CVE). They are advertised with a single goal in mind; selling their product. The fact they use the word “research” in the context of generating these statistics is a joke. As always, I encourage companies and individuals to keep publishing vulnerability statistics. But I stress that it should be done responsibly. Disclaim your data source, explain your methodology, be clear if you are curious about the results coming out one way (bias is fine, just disclaim it), and realize that different data sources will produce different results. Dare to use multiple sources and compare the results, even if it doesn’t fully back your desired opinion. Why? Because if you disclaim your data sources and results, the logical and simple conclusion is that you may still be right. We just don’t have the perfect vulnerability disclosure data source yet. Fortunately, some of us are working harder than others to find that unicorn.